William Artaud (1763-1823) was a history and portrait painter, noted as being a ‘violent democrat’ with nonconformist views and connections. The son of a Huguenot jeweller, Artaud lived in London most of his life and consistently exhibited works at the Royal Academy. He completed paintings for large projects such as the Macklin Bible, and painted various people who are well remembered such as Elizabeth Barrett Browning, yet he has been largely forgotten. However, even a brief study of his life and work reveals numerous avenues to be explored, a few of which will be introduced here. 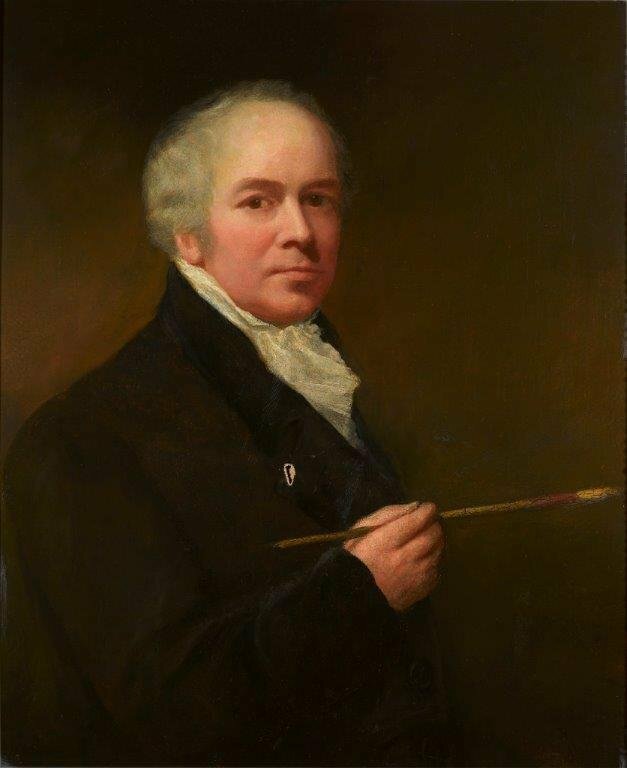 Dr Williams’s Library holds a self-portrait as well as three other portraits painted by him of Joseph Priestley, Andrew Kippis and Gilbert Wakefield. His self-portrait is particularly interesting and very little is known about it. Yet, there is some information that helps to date and contextualise it. It is likely that the self-portrait was exhibited by Artaud at the Royal Academy of Arts in 1822, titled ‘An Artist’, which was the last artwork he exhibited. There is also a chalk pastel drawing dated to c.1822 held by the National Portrait Gallery which looks to be a study for the painting, helping to date the painting to c.1822. One of the only works about Artaud is Albert Charles Sewter’s unpublished MA dissertation (1951) (which also contains some of Artaud’s letters and other documents that have been transcribed). Sewter agreed with the dating of c.1822 and believed that the self-portrait was created to mark Artaud’s retirement. Another academic, James Hall, did not discuss Artaud but suggested that the creation of self-portraits as markers of one’s life or art developed in the 18th and 19th centuries - an appropriate timeframe for this self-portrait. However, one must remember that Hall and many others discuss several different reasons why artists create self portraits including vanity and patron’s requests. Self-portraits are often surrounded by interpretations of what they tell us about the artist and their character, but Artaud’s self-portrait gives very little away. Depicted standing with a paintbrush against a dark background, we know that he was a painter but it tells us little else. Extensive drying cracks have been retouched and covered, and a photograph from before this faintly shows that there may have been an object in the bottom right hand corner; a candle perhaps? Unfortunately the only known copy of this old image is in Sewter’s dissertation, in black and white and with no record as to when it was taken. To Artaud’s contemporaries other aspects of the painting may have been significant, such as his clothing, aspects of the frame, or something which we can no longer see. Hence, more research needs to be done to explore how his contemporaries would have understood the painting. Artaud is interesting to research not only as a painter; he held nonconformist views and throughout his life associated and corresponded with various dissenters. In 1796 Joseph Farington wrote in his Diary that a fellow artist, Edmund Garvey, had described Artaud as a ‘violent Democrat’; a term that historian Kim Sloan notes was not used lightly by Farington. The only other person described this way was Thomas Banks, who had been questioned on suspicion of high treason by the Privy Council. Furthermore, Banks was friends with Robert Smirke, a radical Royal Academian, who strongly supported Artaud’s candidacy for a travelling studentship in Rome. Artaud began a travelling studentship in 1795 after taking the place of Thomas Proctor, who it had originally been awarded to but he died in 1794. He lived in Rome, Naples and Florence during the French invasion of Italy until moving to Dresden in 1798 and back to London in 1799. His letters are excellent sources for historians and whilst in Italy he wrote several letters, some of which discuss the French invasion and reveal his pro-revolutionary attitude. His letters are also great sources revealing details about artist’s social lives, patronage and life during the French Revolutionary Wars. We know that Artaud was in contact with dissenters and nonconformists throughout his life. A few examples being his painting of Joseph Priestley in 1794 and a letter from 1818 in which he spoke kindly of Joseph Hutton, a Unitarian minister. Additionally, whilst he lived in Italy he corresponded with Joseph Lomas Towers, librarian at Dr Williams’s Library, though we do not know what they spoke about. The letters and self-portrait were passed down through one of Artaud’s sisters, who married into the Tayler family. Sewter gained a lot of information and sources from his sister’s descendants, who later distributed their documents, sketches and artworks between several institutions and may have put some up for auction. Sewter’s dissertation includes a photograph and brief description of an earlier self-portrait from c.1793, however the whereabouts of this painting is currently unknown. Sewter seems to suggest it came to Dr Williams’s Library but there is no record of it ever being here, so it may have stayed within the Tayler family or gone to auction. Some academics are beginning to study Artaud, especially for his work in the Macklin Bible, but there are many other topics that ought to be focused on, including his portraits. For instance, the portrait of Priestley alludes to the representation of dissenters in the Royal Academy but also in the public as there were newspaper adverts for a subscription service to receive a print of Artaud’s painting to be paired with an engraving of another nonconformist, Richard Price. Having graduated with a BA in History from the University of Warwick, Emma undertook an internship to learn about the practices of archives and researchers before going to study for an MA in History of Art at the Courtauld Institute in October. At Dr Williams's Library Emma carried out a research project on a self-portrait painting by William Artaud, an artist largely forgotten. Alongside this, she was taught about archives and cataloguing, and assisted in the photographing of the Artaud portait as well as an album containing letters and artworks relating to John James Masquerier.